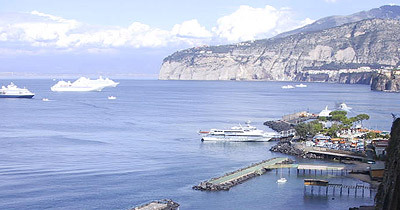 Sorrento, known as Surrentum 2000 years ago, is situated at the southern extremity of the bay. For this strategic position it was a sort of guardian for all the ships coming from south, but also more exposed to attacks from all sort of invaders. Probably founded by Greeks in VI century it passed later to Rome after the Samnite wars (295 b.C.) and became later episcopal seat in 420 a.D. Annexed by Byzantins to the Western Roman Empire it suffered then incursions by Saracens. After the Normans, the Svevians' and the Angionins' dominations Sorrento followed the same history of Naples till its annexation to the Reign of Italy (1860). Today Sorrento is a pleasant touristic city out of the more chaotic Naples, offering interesting cultural visits (Museum Correale, Duomo, Cloister of Saint Francis, etc) and a nice chance for shopping in the old alleys tasting its famous Limoncello (lemon liquor) or to appreciate its nice inlayed wood artifatcs. It’s remarkable the view from its high cliffs on the bay of Naples or at the nearby island of Capri to which once was united. Roman ruins of Cape Sorrento are worthy of visiting if you have time for bit longer stay, as they are out of town.